By next fall, one of University City’s oldest office buildings will look like its newest. With a redesign by global architectural firm Gensler, the former office of Allstate Insurance, at 401 McCullough Drive, will have completed its transformation to Proximity Park – the single biggest available suburban office building on the 19-mile LYNX light rail line. 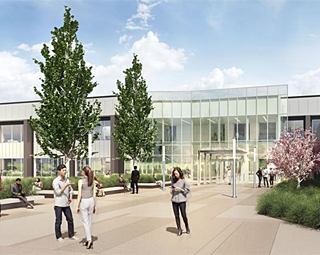 Work will start in the next few weeks on major improvements to the building and 32-acre campus, including a visually striking new entrance and two-story glass atrium, new energy efficient windows, extensive new landscaping and an outdoor meeting area. The building already underwent several months of interior demolition, which included removal of the old mechanical, electrical and HVAC systems. The redesigned building will have all new energy-efficient systems. When the remodeling is finished next August, Proximity Park will offer nearly 200,000 square feet of space for lease in like-new condition – with room for expansion – within a 10-minute walk to light rail and a 1-mile drive to I-85. Colliers International, which is handling the building transformation and its marketing, hopes to find a single tenant for the building. The building also can be subdivided for up to three tenants. “Given the unique design of it and the large campus setting, we feel like Proximity Park will provide a unique opportunity for a company wanting its own branded building with easy expansion potential,” said Brad Grow, a partner in Colliers’ Charlotte office. The site can accommodate an additional 100,000 square feet of office space, plus structured parking for the additional employees. That building will have great curb appeal, Grow said, thanks to its campus setting and the fresh redesign from Gensler. Among the highlights: a new entrance will bring visitors into a two-story glass atrium with decorative grand stairway and second-floor balcony. The name, “Proximity Park,” speaks clearly to the property’s other great selling point, Grow said: easy access to Charlotte by road and rail. The half-mile walk to the McCullough LYNX Station and to nearby restaurants along W.T. Harris Boulevard will be enhanced by a city project under design now to add wide sidewalks, shade trees and bike lanes along the full length of McCullough. The project will be finished in fall 2021. Key Charlotte destinations are short drives away via I-85, including Charlotte-Douglas International Airport (18 minutes), Center City (15 minutes) and Concord Regional Airport (13 minutes). The latter offers extensive corporate jet service as well as commercial flights. Contact Brad Grow with Colliers International at brad.grow@colliers.com or 704-409-2365. View the Proximity Park website and flyer.